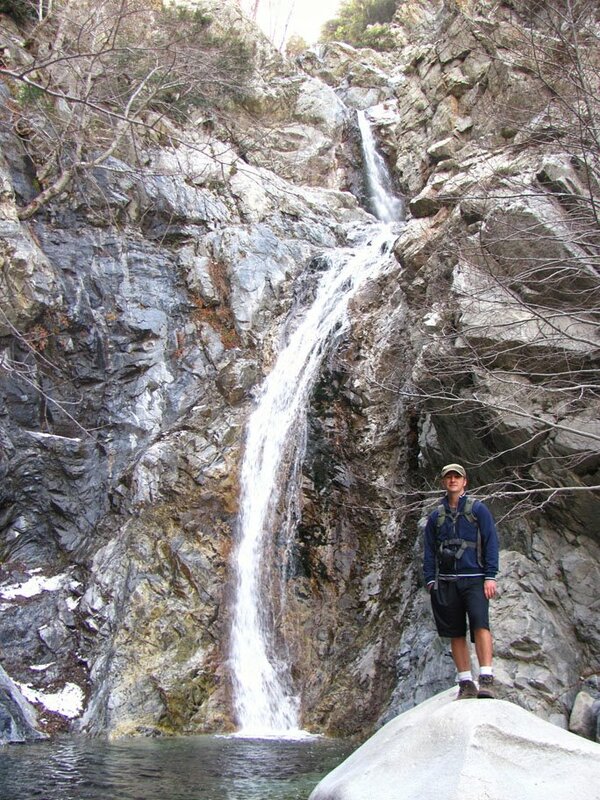 Third Stream Falls is an eighty foot waterfall located in a remote canyon in the Cucamonga Wilderness just above Rancho Cucamonga California. Unlike many of the waterfalls in Southern California, Third Stream Falls flows steadily for most of the year. I first heard about the waterfall from an excellent book called The Definitive Guide to the Waterfalls of Southern and Central California written by Chris Shaffer. I’ve been using his book for 2 years and I’ve visited nearly every waterfall in Riverside, Orange, and Los Angeles County. Third Stream Falls is, without a doubt, my favorite waterfall in the LA/Orange County area. We didn’t see a single other person on the trail, and the noise from the outside world is literally non-existent. My girlfriend and I had been saving this waterfall for a day when the temperatures in the mountain were at least in the fifties. We’ve learned the hard way that temperatures at higher elevations in southern California often vary by as much as 40 degrees. We both bring a jacket and a fleece sweatshirt on every mountain hike we attempt. From route 15, take the Sierra exit just north of the city of Fontana. Turn left on Sierra road and drive 6 miles. Turn left onto Middle Fork Road and drive for another 3 miles until the end. The trail to the waterfall starts in a parking lot at the end of Middle Fork Road. I was extremely surprised to see that the parking lot had its own bathroom because Middle Fork road was in poor condition. We did fine in a Toyota Camry, but I wouldn’t take my Lamborghini down that road. From the parking lot, you climb steadily up the right side of the canyon for 2 miles. You get fantastic views of the cascading river below you. At about two miles in, you come into a giant grove of redwoods, many of which were severely burned in a fire several years ago. We crossed several dry streambeds which were tributaries of Lytle Creek as well as a few very primitive looking campsites which I’ve heard the boyscouts use and a large wooden sign for the Cucamonga Wilderness. After hiking through the redwood grove for about half a mile, the narrow canyon opens up into a giant bowl. This is where you cross Lytle Creek and head for the canyon on the left side of the river with the cascading water flowing out of it. The mouth of this side canyon is at least 30 feet wide with walls over a hundred feet tall. If you are looking for it, you won’t be able to miss it. The side canyon is very steep and you will have to do some minor rock scrambling to get to the waterfall. The path is visible, but you will probably end up stepping in the water a few times. After a quarter mile, the waterfall will come into view. It’s a two tiered waterfall totaling about a hundred feet tall with a decent swimming hole at its base. The water at the base was so cold that I could barely stick my toe into it, but it was crystal clear and very tempting to take a dip. If I do this hike again in the summer, I’m definitely going swimming. We ate lunch at the waterfall, took a few a pictures and then headed back to the parking lot the same way we came in. Coming out took us half the time it took us coming in. Although it’s only a 6 mile roundtrip hike, it took us almost 3 hours to do the whole thing because of the steep elevation gain on the way in.